About the work: This piece depicts the hypothesis that (16) Psyche is the metallic core of a protoplanet, and that by learning about Psyche we can learn more about Earth’s core. It is thought that the protoplanet collided with other material in the early solar system over a long period of time, removing all the rocky layers and exposing the core underneath. For my project, a metallic sheet was cut and bent in the shape of Psyche and suspended from the ceiling. Projected onto the metal Psyche shape is a golden representation of the theoretical protoplanet Psyche and an animation of the process for how they think it became the way it is today. 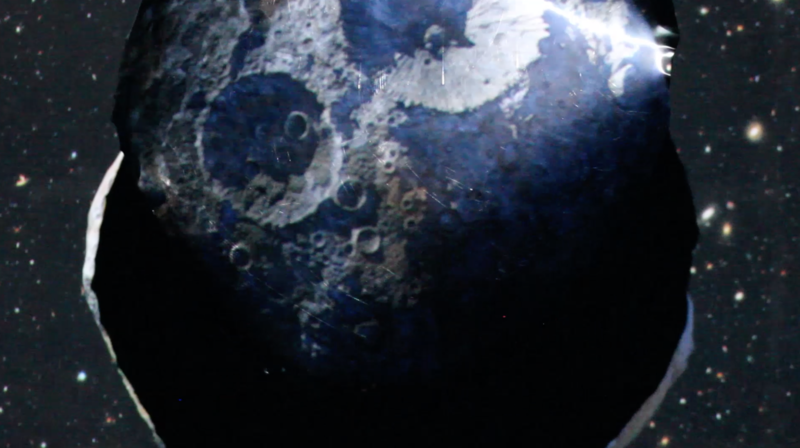 The light projected onto Psyche spins around the room, acting as a beacon to tempt us to explore the asteroid.